I was living in Baltimore in 1983 when I met my wife, Sue. I lived 2 blocks from the Washington Monument- no, not the one in Washington, D.C., but the first one, built with public lottery funds. Beginning in 1799, $100,000 was collected, and in 1815 work was begun. In 1829 the 178 foot tall Doric column with Washington standing atop, opened to the public. They thronged to ascend the 228 steps to the top of the city's highest vantage point of the time. 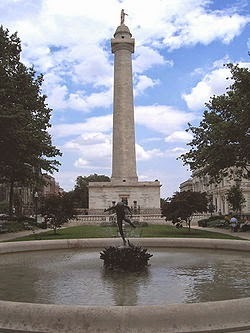 It is still one of the most beautiful of the many monuments in Baltimore. Sue and I used to walk and talk there in the evenings when we were first seeing one another. After a while I tricked her into marrying me and we moved out to the County to raise our family. Fast forward to about 1994. The Monument had been closed for some years due to interior structural problems. A Citizens Committee had resolved these issues and the Monument (located on Monument and Charles Streets) was now open again. You could, for a $1 contribution, climb to the top. And so, we did. Sue took several photos looking in all directions. 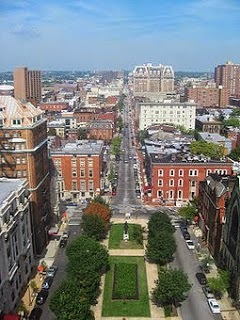 My favorite is this one- looking North up Charles St. In the foreground and to the right is the Methodist Church made with green stone from local quarries. The Church sits across from the unseen Peabody Institute of Music and the Walthers Art Gallery. Looking further to the rear and in the center is the 13 story Belvedere Hotel which was also home to the Engineers Society of Maryland at the time. The whole monument sits in an oasis of a park that bisects Charles Street. The best part of the memory associated with this photo is the actual climb up a circular stairway reminiscent of the Statue of Liberty. The brick and mortar interior was eerie and a little damp- ideal in the summertime, cool- like a cave. With several openings at different levels there were some beautiful vistas of the harbor and surrounding areas. But I always liked the view from the top best of all. I think it's because we made the climb with me carrying our daughter most of the way. And when we were done we were so exhausted, coming out into the heat of a summer’s day. But it's something that we did together and really enjoyed. The original of this photo hangs in our bedroom. It serves as a reminder to us of all the climbs we have made together through the years.